Columbus Public Schools offer a variety of services to students with disabilities from birth through the school year in which the student turns 21. Parents and families work with school staff to develop an Individual Education Program (IEP) or an Individual Family Service Plan (IFSP) that addresses the needs of the student. Special Education programs and services are available at each building in the district. Some specialized programs are available at selected sites. Special education services are also provided to the non-public schools the reside in the Columbus Public School district. 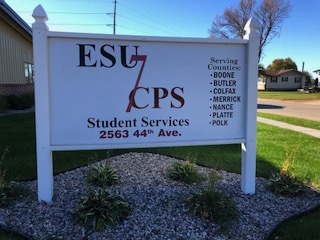 If you have questions about special education services, contact your child’s case manager or the Director of Student Services at 402-563-7000 ext. 12176. The Early Development Network serves children from birth to age three and their families. A child is eligible for the program if he or she is not developing typically, or has been diagnosed with a health condition that will affect his or her development. This network provides services and supports that are designed based on the needs of children and their families with the belief that parents know what is best for their families. The goal of the Early Development Network is to provide coordinated services for families as conveniently as possible. The program helps families to understand their child’s disability and provides assistance in dealing with situations that interfere with the child’s development. Prior parental permission is needed on all referrals made to the program. Columbus Public Schools has a current child find procedure in place to assist in locating, identifying, and evaluating children residing in the district who may have a disability and may qualify for special education services. If you are aware of a child who may be eligible for special education services, please contact your schools administrator or the Student Services office at 402-563-7000 ext. 12176. Columbus Public Schools also have a partnership with Central Nebraska Community Action Partnership (Head Start). To be considered for Head Start, please call: 402-564-1124. Columbus Public Schools have three full-time certified registered nurses. In addition, each elementary has a full-time health aide. Columbus Public Schools only provides busing for verified students who's IEP or IFSP states they qualify for bussing services. This is an IEP or IFSP team decision. 402-563-7015, then option 2, then option 3.
or Susan (Student Services secretary) dial: 402-563-7000 option 9 then 10013. Currently Columbus Public Schools have 4 school wide Title I buildings. The program has been in existence for more than 40 years, yet some may not be aware of the many ways it assists the education of our youth. Title I, Part A came into existence as a section of the Elementary and Secondary Education Act (ESEA) of 1965. As the largest federal assistance program for our nation's schools, it provides funds for reading/language arts and math curriculum to students in impoverished areas who are at risk of failing to meet state standards. Federal funds from the U.S. Department of Education are given to State Education Agencies (SEA), which then direct those funds to Local Education Agencies (LEA). Private schools, state agencies for neglected and delinquent youth, and homeless shelters also receive federal Title I monies. According to the U.S. Department of Education's Website, Title I reaches approximately 12.5 million students in both public and private schools nationwide. Of that number, 77% of the students served are in grades Pre-K through 12. Ninety percent of U.S. school districts and approximately half of all public schools receive some Title I, Part A funds. Those funds can be administered through two types of programs. LEA's may offer a school wide program in which the whole school is served, or a targeted assistance program. A school wide program's objective is to improve academic achievement, related to State/District standards, throughout the whole school. Targeted assistance programs identify specific students who are the most "at-risk" of failing or not achieving State/District standards and designs methods to help those students. Columbus Public Schools have a counselor in every building to help support students. The mission of the K-12 Comprehensive Guidance program for the Columbus Public Schools is to provide a comprehensive and developmental counseling program addressing the academic, career and personal/social development of all students. If you have questions, please contact your student’s school counselor.